Bike to School month was a huge success at our local elementary. 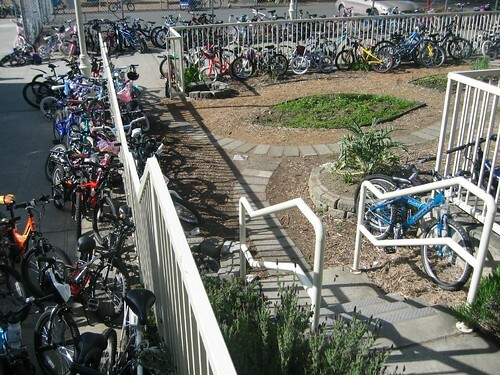 We averaged about 60 riders every day–the bike racks were full and fence and gate locking was overflowing every day this month. It was certainly a beautiful sight. A big thanks to Leslie and Clint for leading the effort – you did a great job! 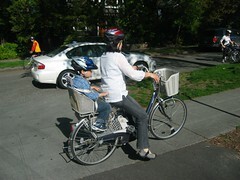 Many parents joined their kids and pedaled to and from school all month. I talked to a few who said they were hooked and plan to get to school on two wheels from now on. Right on. Others say “they’ll see” if they can keep it up. I tried to encourage any parent who would listen to keep on riding. It’s so great to see the kids excited about riding and the traffic reduction around school was definitely noticeable. My two kids did a great job – they rode every day this month. The five-year-old pushed his bike up the hills with gusto and I’m pretty sure he never complained about it (which is notable – he can by whiny at times). I always gave him the option to take a ride on the Xtracycle and he usually declined the offer in favor of doing it on his own. I’m so proud! The seven-year-old made huge progress as well. She can now ride up three of the six hills we have to summit to go just about anywhere from our house. By next year she’ll probably be riding up them all. I think my days of carrying both of them on the back of the Xtracycle are numbered. I imagine they’ll only ride back there for longer distance rides – since they have the short ones mastered. Maybe I’ll get to ride my new Oma more than I think! This entry was posted in alternative transportation, bigger than here, bikes, kids, seattle and tagged Bike to School Month, Family Cycling, kids, seattle. Bookmark the permalink. Congrats on your great biking! I am hoping to help with the bike-to-school efforts at my son’s school next week. If you were interested in writing about how families were encouraged at this school, that would be great. Also, I can not recommend enough getting kids onto bikes with gears as soon as they are big enough. It makes those hills SO much easier. You still end up walking some, but not nearly as much. Ditch the little kids/bmx-style bikes ASAP. Now if anyone has recs on what to get for a soon-to-be nine year old who wants a road bike with drop bars like his dad’s . . . Thanks! We’re having a lot of fun. I’d say the biggest motivator for families was seeing other families riding every day. There is something to be said for joining the crowd – the number of riders grew as the month went on! It was so great to see. I’m curious to see how many families keep it up over the last weeks of school.